Take a journey deep into South Texas, where Lucille Thomas Kruse grows up as a young girl in Falfurrias during the 1920s and 1930s. The Thomas familys fate is determined when Grandfather Thomas moves all his belongings and farm animals, including his beehives, to Falfurrias in an immigrant railroad car. In letters from 1907, he praises the lush and fertile land with fl owing artesian water. It also turns out to be a great place to grow up, and Kruse recalls life as it used to beexploring the farm she grew up on where she rode horses and found adventure around every corner. When she became a teenager, excitement consisted of climbing onto the roof of the courthouse or trying to outrun a jackrabbit in a car. Kruse also recalls her sophisticated city relatives who streamed in to visit and experience the family farm. Eccentric ranchers, older folks who remember battling Indians and hunters who rely on their hound dogs to go on wolf hunts all fi gure into this historical account. 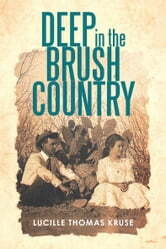 See how life used to be and discover a forgotten piece of America as you venture Deep in the Brush Country.